Thanks to Frank Panacci for the headsup! Rush Signs To Roadrunner Records! Today Roadrunner Records issued a press release announcing that Rush has signed with the indie label. "We have tremendous respect for Roadrunner Records, and what Cees Wessels and Jonas Nachsin have built on a worldwide level. After years of Roadrunner pursuing the band, Tom Lipsky presented a deal that worked and the timing was right. We wanted to be at a label focused on the rock genre – and that’s Roadrunner," said Ray Danniels, manager of Rush. While the press release demonstrates excitement by both Roadrunner and Rush manager Ray Danniels, it is unclear how exactly this will affect Rush. The fact is that Roadrunner is an independent label which is owned and distributed by WEA (i.e. Warner Elektra Atlantic), or in otherwords both are subsidiaries of one large umbrella. This is apparently a lateral move from a major label to an independent label that is distributed by a major label. This is supported by the fact that Rush owes/owed Atlantic one more studio album under their previous aggrement; apparently the previous aggreement is being fullfilled by the new arrangement with Roadrunner, although that is purely supposition at this time. In addition, the time period of this record deal remains unspoken. Read the complete press here. For a video press release click here. - Thanks to Brad, John, Frank, Darren and everyone else who emailed for the headsup! Neil Peart has updated his website with a the September 2011 issue of Bubba's Book Club. In this issue, Neil discusses only one book, After Many a Summer Dies the Swan, by Aldous Huxley. Click here for more. The September issue of the Costco Connection [available in stores or online here] features a promotion for the Rock Icons series including Rush's Icon 2 (released July 19th), including a brief interview with Geddy Lee. Geddy Lee: Oh yeah [laughs], I used to bring it up at the beginning of every tour because there were times when it felt quite daunting to have to deal with all the electronic apparatus when I really just wanted to sing and play bass. So, yeah, I’ve had to wrestle with that question quite often. But, in the end, we’re quite a tight unit, the three of us. And we just kind of figure that our fans would rather see us up there with our technology rather than see us fill up the stage with sidemen. We opted to go the difficult route. But I did get them [guitarist Alex Lifeson and drummer Neil Peart] to share some of the sequencing responsibilities. So that helps a bit. GL: Yeah, especially on some of our songs. Sometimes you write a song that has a really cool riff, and then you write the melody later, and record it separately. Then when you go to rehearse it, you go, “How do I do this?” because one part has very little in common with the other part. It’s hard to get your brain synchronized … you kind of split your brain in two, and, if you practice it enough, it starts to come naturally. Sometimes you have to compromise a bass part a tiny bit to let it fit more comfortably into your brain pattern, but generally I’ve found it’s like Malcolm Gladwell’s 10,000-hour rule [Author Malcom Gladwell says that the best way to achieve success in any field is to spend 10,000 hours honing your craft]. Just keep playing it, [and you will] eventually get it." "Costco has one Fender Geddy Lee Bass® guitar to give away. For a chance to win, email your name, address and daytime phone number to giveaway@costco.com, with “Fender Geddy Lee Bass” in the subject line. Or, mail a postcard or letter to: Fender Geddy Lee Bass, The Costco Connection, P.O. Box 34088, Seattle, WA 98124-1088. Value is $1,399.99. NO PURCHASE OR PAYMENT OF ANY KIND IS NECESSARY TO ENTER OR WIN THIS SWEEPSTAKES. One winner will be chosen for each item. Purchase will not improve odds of winning. Sweepstakes is sponsored by Universal Music Enterprises, 2220 Colorado Avenue, Santa Monica, CA 90404. Open to legal residents of the U.S. (except Puerto Rico) who are age 18 or older at the time of entry. One entry per household per prize. Entries must be received by October 1, 2011. Winners will be randomly selected and notified by mail on or before November 1, 2011..."
Thanks to Sindrew and Paul Southward for the the headsup! Orange Amplifiers' Music Aid for Joplin fund-raising auction is currently underway, and will come to a close Wednesday, August 24th. The auction is to help those affected by the worst tornado season to hit the USA in more than 50 years. 153 people were killed in Joplin, Missouri and the Glory Days Music Store also fell victim to the disaster. As a result of this, Orange will be donating a rare and valuable Union Jack half-stack worth at least $6,000 – the last of only 20 made. The company has also encouraged support from other manufacturers and suppliers and the list of items being added to the auction is being updated daily. Included in the list of contributions is Sabian cymbals 'money-can't-buy' 14” Paragon Crash, personally signed by Rush’s Neil Peart to be personalised with the winner's name. Also included is an Orange CR50BXT bass amp signed by Rush’s Geddy Lee also personalized with the winner’s name. Last month I began working on updating the "News Archives" for the albums released since 2000. This has led to a major project, the creation of "The Rush Transcript Archive"; but first, some quick back history. The individual album News Archives began back in 2000 with the release of My Favorite Headache, when I began keeping track of various online news transcripts and the like. I later created similar archives for Vapor Trails, Feedback, Snakes, etc. Over time, however, those News Archives got lost in the depths of my various pages and were not exactly easy to find, especially to new or infrequent users to this site. With that in mind, I decided to move most of the contents of these News Archives to a single centralized page. I quickly went to work on it and soon realized something was lacking...there was very little online content from before the year 2000. This problem was easily solved, however. As a member of the National Midnight Star mailing list, I remembered receiving transcripts of everything from magazine and newspaper articles to radio interviews and more, all shared from Rush fans from around the globe via TNMS. To flush out the pre-2000 content, the old NMS transcripts have been invaluable. In addition to TNMS, I have hundreds of news clippings to be found in my Tour Archive, some of which were also worthy of transcribing. And of course, I've been collecting various magazines featuring Rush through the years. I've been working on transcribing these as well, and many have also been transcribed already by other Rush websites and messageboards. So that's the back story. I've added the new "Rush Transcript Archive" to the "Literature" tab on the main menu. Included are numerous magazine cover stories from the 80's and 90's which had nearly been lost, including transcripts from multiple issues of Guitar Player, Metal Hammer, Guitar World, Modern Drummer, Circus, Kerrang, Guitar For The Practicing Musician and more. Also included are more recent transcripts of Classic Rock, Ontario Golf, Prog, Vintage Guitar, Guitar World, Bass Player, Bass Guitar, DRUM!, Rhythm magazines and more, many of which were provided by John Patuto at Cygnus-X1.net. This massive archive is an ongoing work in progress, and I'll be adding to it frequently in the future. Please feel free to email any suggested additions (high resolution scans work best). To be notified of new additions to the Rush Transcript Archive, follow my Twitter feed at http://www.twitter.com/pwrwindows, or follow me on Facebook. His early work was shot and edited on film but lately he had become enamored with Video effects and had shot his last few projects on Videotape. I personally thought he seemed more concerned with technology rather that esthetics. The Floating Aimee Mann Video. An edit suite was set up in the control room of National’s largest stage where I would live for the next seven days. You can see the edit suite at 2:17 in the Rush Video. Zibig moved his wife and children into one of the green rooms. Rush and Aimee Mann moved into adjoining rooms. I got a room in a Holiday Inn across the street from National I never saw. Zibig had shot footage of country landscapes for Rush and the idea was to shoot short pieces of Rush performing the song against green screen and composite them together. When we started working he decided that he loved the stage and wanted to composite Rush over that instead. I suggested that we shoot them live in the stage but Zibig wanted everyone to 'float' around the stage. He also insisted that everything had to happen 'live.' Each new layer would be placed on top of the preceding layer without making protection copies or 'laying off' a copy, as we used to say. The green screen footage was shot with the same giant studio camera Aimee Mann is using in the Video. Zibig would give some vague direction to Rush, I would set up the effects, play the audio track and press record and multiple One-Inch tape machines would roll up on the third floor. For 3 days in a row. It didn’t matter what time it was. If Zibig got an idea at 3 in the morning he would wake everyone up (I was sleeping in the control room) and we would all go to work. We started on Saturday morning and on Tuesday night we finished." - Glen Lazarro, 99Tigers.com Thanks to Rushfanforever for the headsup! There are two Rush Wall Calendar's currently available for preorder at this time. 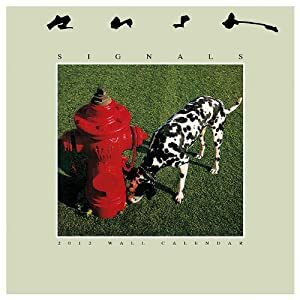 The Official 2012 Rush Signals Wall Calendar will be available (Geddy's birthday!) and can be ordered here. A second 2012 calendar features Rush's album covers and will also be available in July, and can be ordered here. 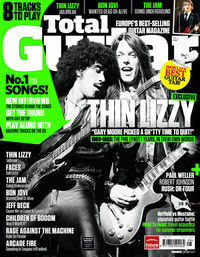 Alex Lifeson is featured on the cover of the current (September) issue of Vintage Guitar which includes the feature story "Rush Keeps Rollin'". The complete transcript is now available. - Thanks to John at Cygnus-X1.net for the transcript, with help from RushFanForever. Eddie Trunk's Essential Hard Rock and Heavy Metal is a new comprehensive book released April 1st from Eddie Trunk, the host of VH1 Classic's That Metal Show, as well as XM Radio's Eddie Trunk Live and Friday Night Rocks in New York City. Eddie includes Permanent Waves among his favorite all time albums, and the book includes an entire chapter on Rush, who were guests on both That Metal Show in 2009 as well as two separate episodes of Hangin' With in 2005 and 2006. Click here to order. "Known as a leading expert on all things hard rock and heavy metal, Eddie Trunk continues to entertain fans on the radio and as the host of VH1 Classic's hit television program That Metal Show with his passion for music. In his debut book, Eddie discusses his most essential bands, his unique personal experiences with them, his favorite 'Stump the Trunk' anecdotes and trivia, as well as his favorite playlists. Whether you're a classic Metallica or Megadeth metalhead or prefer the hair metal of old-school Bon Jovi or Poison, Eddie Trunk's Hard Rock and Heavy Metal salutes all who are ready to rock!" "I was working at VH-1 Classic. I'd interviewed Geddy and Alex, twice, and you know, Neil is shy and reserved and does not really do interviews. I'd gotten a call from a book publisher doing press for one of Neil's books, about him biking all over the country after the tragic loss of his wife and daughter. Neil wanted the interview to be with me because he'd seen me talk to Geddy and Alex and he felt like he trusted me- that I 'got' the band. It was a great honor. He showed up at the door with zero entourage. Just wearing a backpack and a baseball cap - the most unassuming guy in the world. You'd never know it was him. After, he went out for a smoke and I went outside with him. We kept talking out there, in the heart of New York City, and not one person passing by realized who it was. Just amazing." - Eddie Trunk Thanks to RushFanForever for the headsup! iDrum in association with DW drums, Sabian cymbals and ProMark sticks is offering a once in a lifetime opportunity to bag some hightly collectable, not to mention valuable products from rock drumming legend, Neil Peart. The competition to own a piece of drum history, including a complete Neil Peart Evolution Snare Collection (that's four snares in a road case! ), a three piece set of Neil's Sabian Paragon cymbals, as well as a BRICK of Neil's custom designed signature ProMark sticks. To enter simply subscribe to iDrum (it's free!). "'It's been my life's tangent,' says Neil Peart on the subject of the pursuit of excellence. Since he joined Rush back in 1975, Neil has been the poster boy for prog - disciplined, metronomic and powerful. When you meet him in person it is easy to see where the power comes from - he's an imposing guy, a fact often obscured by the gargantuan drum kit that usually surrounds him. Watching Rush onstage during their current Time Machine tour, it is clear that something fundamental has changed. The band known for meticulously recreating their studio recordings live on stage are jamming. More than 35 years since Neil joined the world’s foremost power trio, Rush are still pushing themselves and breaking new ground. Rhythm Magazine met up with Neil and his drum tech Lorne Wheaton backstage at London’s O2 Arena to talk about his kit, technique, influences and constantly developing as a drummer." Click here for more.